Ant-Man and the Wasp is now the twentieth movie in the Marvel Cinematic Universe, a prospect that would seem dire had it not been for 2017 and 2018 being arguably the best string of movies we’ve gotten from the MCU. Whether it’s Spider-Man: Homecoming, Black Panther, or especially Avengers: Infinity War, this series of films has never been stronger. The good will of those movies was enough to give me hope that I’d like Ant-Man and the Wasp better than its predecessor, the 2015 first Ant-Man seeming inconsequential, poorly plotted, and a little boring. I’m happy to say that this does improve on the last run, and continues Marvel’s string of success. Paul Rudd’s Scott Lang is no longer Ant-Man to start the film, sentenced to house arrest after teaming up with Captain America’s rogue squadron in Civil War. 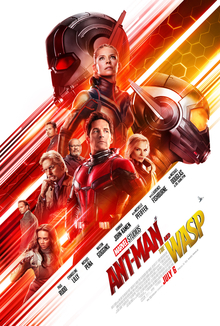 He is perfectly content to get closer to his daughter and help his buddy Luis (Michael Pena) with a new security business, but all is not well with Hank Pym (Michael Douglas) and his daughter Hope (Evangeline Lilly). They are partially on the run as well, with the U.S. government mostly outlawing their form of technology, but they are determined to attempt to rediscover Pym’s long lost wife Janet (Michelle Pfieffer) when Lang gives them a clue to her whereabouts after visiting the Quantum Realm last film. At the same time, the tech they need to save Janet is under siege when a strange villain phasing in and out of reality (Hannah John-Kamen as Ghost) wants it, as does local gangster Sonny Burch (Walton Goggins). Maybe it’s that director Peyton Reed had more control over this film than the last one (where he worked with a ton of material previously presided over by Edgar Wright) or that he became more accustomed to making larger films, but this movie feels more stylistically solid than the first Ant-Man. Part of that is due to letting Paul Rudd’s comedic side really shine in the lead, and he really makes this movie his own, and I think part of it is due to focusing more on being a comedy than an action heist like previously. I didn’t buy the stakes or the tension in the last movie, and all of that is largely abandoned for a cluster of various subplots thrown into a blender. There’s the quest to save Janet, the government after Scott, Pym, and Hope (with Randall Park’s addition as an FBI agent really being a positive one), Ghost’s attempt to become whole, and Sonny’s attempt to make some cash. None of this matters in the grand scheme of things, but it makes the movie wacky and fun. Maybe that’s all that an Ant-Man movie needs to be. The action scenes and heists are all packed with some cool effects like making cars and buildings small but PEZ dispensers big. That’s all unique, but you likely saw it in the trailer. The scientific mumbo-jumbo isn’t fun to listen to, nor is the fact that it seems like a majority of our characters could probably work out an arrangement that would work for everyone. None of the stakes really feel real, but at least this one manages to remain fun in the process. Outside of a few hints about what powers can come from the quantum realm, it isn’t until the post-credits scene where we get anything that actually has importance for the larger MCU and Thanos. That’s neither a positive or a negative to take away from this film, just know that (like the second Guardians movie) making one of these a straight-up comedy that detaches from the larger universe is a fine choice. It’s an enjoyable fantasy comedy. If you haven’t heard, there’s a fair bit of controversy surrounding this movie, and a majority of the criticism comes in the form of “this is not the movie we need right now.” It’s maybe fair to say, especially from one side of the political spectrum, as this movie slightly glorifies the concept of closing off the southern border and accepts as fact the idea that crime is imported from Mexico. We start with an idea that the Mexican cartels are more than willing to allow terrorism into the United States, to the point that the government classifies the cartels as terrorist organizations themselves. Then, our movie uses espionage tactics to force the cartels to fight one another and try to neutralize this influence over the southern border. The movie also brings in Josh Brolin’s Matt Graver to use any means necessary to accomplish the goal of securing the border, including drones, large scale ammunition, and maybe even a kidnapping of one of the cartel’s leader’s daughters (Isabela Moner). The first Sicario worked as a fish-out-of-water story. It took a government operative in Emily Blunt and had her get involved and give approval to an underground government operation in the CIA which pushed against the bounds of legality. The movie was brutal, and stood for a loss of naivete for our main character, while at the same time showcasing the difficult choices the U.S. government makes when dealing with such crime. 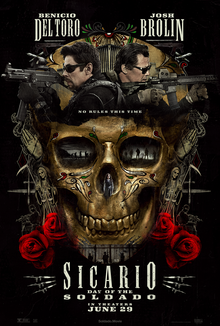 The movie was called Sicario due to the U.S. having a previously associated cartel member Alejandro (Benicio del Toro) work for them as an assassin. This movie largely abandons the character-centered nature of the first one. While it’s still written by dreary-script maestro Taylor Sheridan, his film is in another director’s hands, and the style is very different. In fact, the movie itself is not as stylish, losing Denis Villanueve (a powerhouse director) and cinematographer Roger Deakins for some less known individuals. Instead, we get a ham-fisted re-upping of Alejandro’s desire for revenge but also sensitivity in things that remind him of his dead daughter, ie, the kidnapped cartel daughter in this film. The difference is that it doesn’t serve a character oriented story. This film is more than willing to dive further into the filth of questionable choices and backtracking done by American officials. Many critics argue that the film endorses some of these horrific tactics, and I would agree, but I don’t judge a movie based on my political preferences, and would prefer to leave that debate outside of this review. I don’t care if it’s “not the movie we need right now.” I care about whether the movie is well-made. For the most part, there’s some tension, the film is well-acted, and is shot decently well. We still have cool locations and an attention to a part of the world that American cinema rarely covers. Josh Brolin continues his hot streak, as he really is the best performance in this one after Del Toro and Blunt stole the last one. In the universe this movie presents, the cartels are looked at as terrorist organizations which need to be neutralized, and our characters choose a specific way to try to do it, with limited success. I was interested in the plot this movie was selling me, was interested in the attempt to relate it back to real-world implications, and despite the last three scenes that I really didn’t like (which set up another sequel…), I largely enjoyed and related to this movie. The problem is that it will end up being forgettable. There’s not a ton of memorable moments in this one, and although there is an argument to be made that this film is a result of fear-mongering by conservative media about the danger of terrorism flowing over a patchily-secured border, I can’t comment on whether that’s valid or not. As a film, this does enough for me to recommend sitting through. 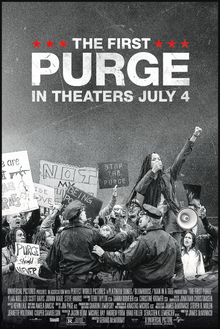 It took four films, but the Purge has finally discovered a setting, pace, and system of ideas that make it work. Starting back in 2013, series creator James DeMonaco hatched an idea with Blumhouse to try to capture a unique idea about watching society completely crumble over the course of one night by making crime legal. The first became a home invasion thriller, the second a stale action thriller, the third an inept political thriller. Now, finally, the series has finally registered what it wanted to say, and the result is a pretty interesting movie with some well-executed action sequences and some spooky horror sequences. The movie focuses on a group of people living on Staten Island, paid a sum of money to stay on the island during ‘the experiment,’ which essentially amounts to the titular First Purge. America has been taken over by an alt-right political party, and they have an idea to lessen the financial burden of a growing welfare state: allow the low income communities to rip each other apart during this night, and financially reward those who engage in behavior such as murder and burglary. The people we follow are people who need the money and decide to stay, but intend to hide and wait the night out while others engage in bad behavior. The problem occurs when people hold ragers and commit minor offenses, but major upheaval isn’t taking place, leading the alt-right party to send out militant squadrons of police to start stirring up trouble, leaving the people to retaliate in defending themselves. The obvious political parallels don’t need to be hidden in subtext. The racial and economic undertones to how this movie tells its story worked for me, regardless of its lack of subtlety. The government is controlled by a party of white nationalists, and they send those same white nationalists to commit the murder they wanted the impoverished to do on their own, an interesting idea about how even when legal, the human condition does not naturally drive someone to violence. It only, in this film, really occurs in self-defense. And the political parallels of this party complaining about the monetary draw of the welfare state against public opinion that wants low taxes is a conundrum every party has dealt with, and their solution is an intolerant one: eliminate those that can’t do it on their own. Is it on the nose? Sure. But, I found it to be refreshingly honest, taking the backdrop of the previous movies and actually telling a real story. There’s some glorification of the gangs as community defenders in this movie which I didn’t care for, but it was a necessary piece of the puzzle. As for the horror elements, the characters who wish to purge get these colored contacts with cameras so the government can track and monitor them. This gives them a glow, an eerie light that peaks out of the dark as people wander the streets. It gives a couple interesting horror sequences that add to a movie mostly used as an action thriller. Overall, I can’t complain about this movie. It hits its target audience and captures a specific feeling and message, making it well-made enough to recommend.